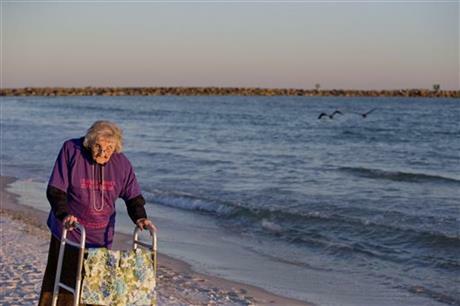 Ruby Holt of Tennessee has seen the ocean for the first time just weeks before her 101st birthday. Ruby Holt has spent most of her life on a farm in rural Tennessee picking cotton and said she never had the time or money to go to a beach. “I’ve heard people talk about it and how wonderful it was and wanted to see it, but I never had the opportunity to do so,” she said. Now she has been on an all-expenses paid trip to the Gulf of Mexico. Ruby Holt’s holiday was funded by the assisted living centre where she lives along with a charity which grants wishes to elderly people called Wish of a Lifetime. She said she had never seen anything as big as the ocean but kept describing the November weather as “cold”. Mark Davis, executive director of Brookdale’s Sterling House, where Ruby Holt lives said two employees filled out the application for her after finding out that she wanted to see the ocean for the first time. Ruby Holt, who has four children, said she was always too busy on the farm or working in a shirt factory to travel and that the family never had enough money. The holiday to the beach in Alabama was the furthest she had ever been from her home in Giles County. Ruby Holt said she had only left the state of Tennessee once before. To visit the beach the woman travelled 400 miles. Ruby Holt had been lent a motorized wheelchair which had been adapted to be used on sand and with the support of care workers was able to stand and dip her toes in the water.